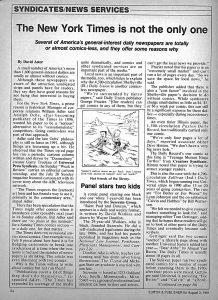 Comics-less-publications. 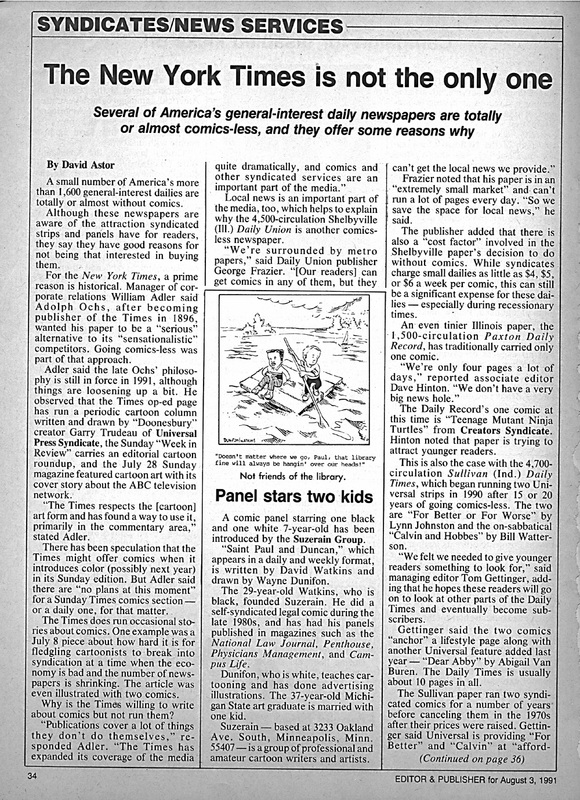 It almost sounds impossible in the newspaper business but there are actually “comics-less publications” using no cartoons whatsoever in their format.This old article appearing in the ‘Syndicates / News Services’ section of E&P magazine is a stark reminder of that fact. At last check, I believe the New York Times is still void of any cartoons and comics features. If you know something different, don’t hesitate to contact and let me know. 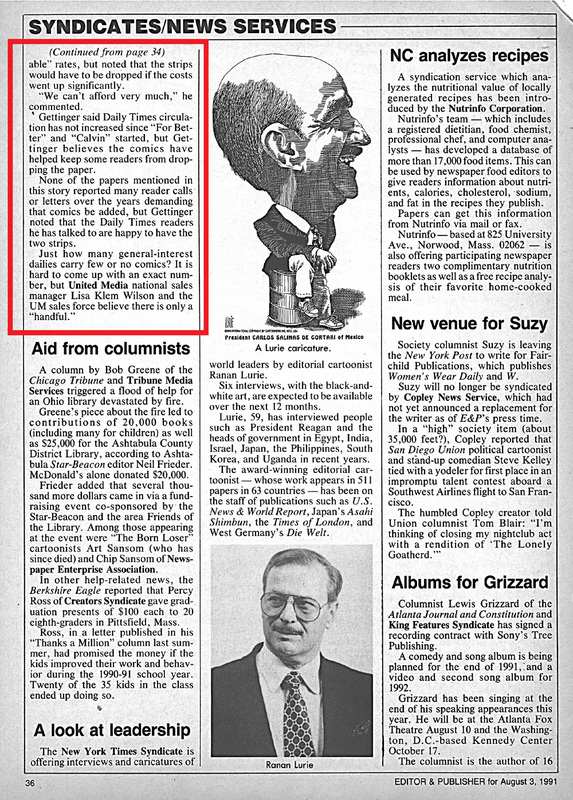 I don’t get the NYT but even back in 1991 they had no sense of humor. Mind you, they are considered “liberal” and I believe they’d embrace cartoons to prove this fact. Comic strip like Doonesbury would be ideal. Then again, maybe not. Newspaper editors can be fickle at times and probably more so in our new “PC oriented” culture. I’m able to understand smaller city or municipalities that have a daily paper with little or no room for comics (keeping a local economy in mind), such as the Paxton Daily Record mentioned in the article (based in Illinois) with a very low circulation of 1,500 daily readers / subscribers. I actually give small papers like this credit for staying afloat in order to give a local economy it’s printed news. I mean, there are weekly newspapers in certain parts of our country that have circulations of 5,000 and 7,500 readers per week and they have an extremely healthy advertising base. 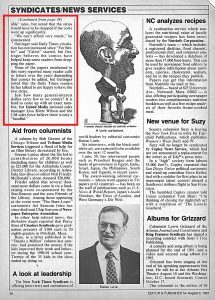 And check out The Sullivan Daily Times in Indiana (circulation was 4,700) that went for a period of over 20 years without any cartoons or comic strips – they actually signed up for two comics! They were Lynn Johnston’s For Better Or For Worse and Bill Watterson’s Calvin & Hobbes. With these two strips no longer in production, I wonder what the publication uses now. Or, better yet, based on today’s economy and the downturn in newspaper publishing, is that paper even being published anymore?